Italian sculptor. His father, Vincenzo Marochetti, was a prominent advocate and functionary. The family moved to Paris shortly after Carlos birth. Marochetti trained with Franois-Joseph Bosio and, after failing to win the Prix de Rome , travelled to Italy in 1822 at his own expense. On his return he showed Young Girl with a Dog (Turin, Castello dAglie) at the Salon of 1827. His exhibit at the Salon of 1831, Rebel Angel (plaster; untraced), established his allegiance to the Romantic cause. Marochetti succeeded in projecting this Romanticism in public monuments: in his marble relief of the Battle of Jemmapes (1833-34) on the Arc de Triomphe and, in a more original form, in the group of the Assumption of the Magdalene (marble, 1834-44) for the church of the Madeleine, Paris, the latter an apotheosis deriving from the Baroque , but strongly symmetrical and denuded of scenic apparatus. Marochettis monumental Romanticism received wider exposure in a gift he made to his native city, the equestrian statue of Duke Emanuel-Philibert of Savoy (bronze, 1833-37; Turin, Piazza San Carlo). This is characterized by a degree of historical drama unprecedented at that time in public statuary. In recognition of this gift, Marochetti was made a Baron of the Kingdom of Sardinia. The success of this statue resulted also in the commission for a bronze equestrian statue of Ferdinand, Duc dOrlans (1844) for the courtyard of the Louvre (now Chteau dEu, Seine-Maritime); here Marochetti went to the opposite extreme of literal modernity. 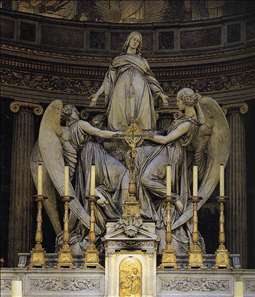 Resentment against Marochetti, viewed by many as a courtly foreign interloper, came to a head over the preparations for the tomb of Napoleon in the Invalides, when it was thought he had attempted to bypass competition. An equestrian statue of Napoleon, eventually commissioned in 1842 for the Esplanade des Invalides, was never permanently erected. Simultaneously, and with a conspicuous disregard for patriotism, Marochetti was working on his equestrian statue of the Duke of Wellington for Glasgow (bronze, 1841-44). See more details about "Mary Magdalen Exalted by Angels"